Well, a simple glance at your room is enough to know almost everything about you. What are you? How are you doing? What are you pursuing? Your taste and preferences ,everything. Now, you must be wondering how is this possible? Well, it will just take a couple of simple questions, and you too will agree with the above statement. Look at the images below and tell me whom do you think this room belongs to? Whose room do you think it is? I’m pretty sure just by looking at the image you will be able to make out that the room belongs to some college goer, who is interested in playing guitar and Basketball. He doesn’t like studies and but before the exam pulls an all-nighter (Books kept in order on the top while notes stuffed in the lower end of the table). All these things can be incurred with a single glance, so the first impression of your room is extremely important. Since you are very well aware that your room is a reflection of what you are, you need to make it presentable. Well, for obvious reasons, this kind of room looks good for the time you are in college, but not any further. Now, what you can do to make your room look appealing and still has a story of its own to tell. Even a well-arranged room can be redesigned in such a way that it looks good and elegant. Wall decors are the most common ways of getting a smoothing and desired look to your room. It can also be something very personal or a painting of some famous person or quote that is an inspiration for you. The wall decor can be as big as a wall sized frame art, or as small as a customized message just inscribed on the wall. Also, you can get your wall decorated in many ways, you can ask the painters to paint the wall depicting your image or of someone you love or just hang a simple personalized name art painting on the wall. Humans are not color blind. They are able to see and differentiate between different colors. It is always advisable to get the room colored in such a way that it compliments with the furniture. Also, if you have apersonalized frame art then go for the color in the background of the image. It will bring out the image even better. A Painting speaks more than an entire book. The same painting can have numerous interpretations. That is the reason, tons of scholars study the same image over and over again, and that is why they are sold to real collectors for millions. Don’t worry, I’m not asking you to get a Picasso or Van Gogh, but you can get something much more personalized. 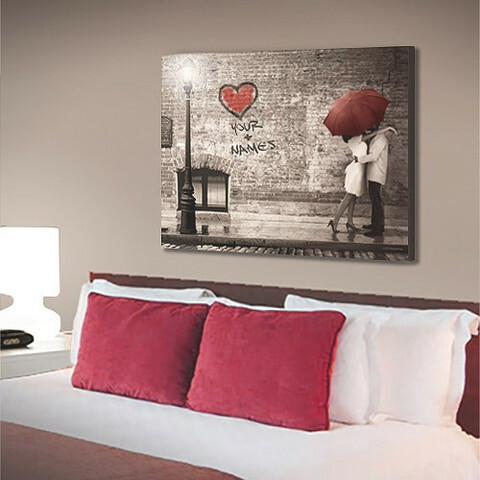 Like a personalized name art painting or even a canvas of art, that appeals to you.